We have recently discovered a great website which has some innovative design ideas for diy projects. 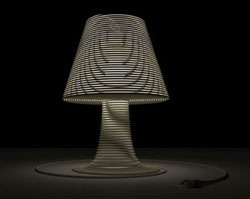 This coiled-cord lamp caught our eye as a possible project you could try to produce a unique piece of lighting for your home. The lamp is made from basic frame with an extension cable wound round it to create a striking table lamp which when lit, is stunning. The cable idea can also be used as a design for a pendant light from the ceiling. Many thanks to Dornob.com for this great idea!